In his formative years, Michael Kirby AC CMG was already on the road to becoming a judge. Recounting his journey to Melbourne Law School Dean Professor Carolyn Evans in front of a packed theatre at Melbourne Law School on Monday 20 March, Kirby spoke of his prowess in history and English, subjects he believes were crucial to a foundation in the law. After high school, Kirby dabbled with what he described as ‘a glorious career’ in student politics at the University of Sydney. While he was tempted to tread down the well-worn path into the political sphere, something was stopping him. “I thought I would do well in politics,” Kirby said. “But as I grew to understand my sexuality, as a gay man, I knew that I would have to either be completely deceitful and pretend, or that was not the way for me. Kirby did not, of course, simply fall onto the bench of the highest court in Australia. Five years as a solicitor allowed him to get a grounding in the profession, and he was soon called to the New South Wales Bar. However, ‘a more orthodox life’ at the Bar was not enough for Kirby. He was appointed as Deputy President of the Australian Conciliation and Arbitration Commission in 1975, becoming the youngest man appointed to a federal judicial office in the process. From there, Kirby’s career took off and marked the beginning of ‘quite a different life’. He was also named President of the Australian Law Reform Commission in 1975, before taking up a place on the bench in the Federal Court of Australia in 1983. A year later, Kirby found himself presiding over the New South Wales Court of Appeal, and finally in February 1996, the High Court of Australia came calling. It was there Kirby made a name for himself as ‘the great dissenter’, unafraid to voice controversial judicial opinions that were, in many instances, ahead of their times. One such case was Al Kateb v Godwin  HCA 37. In his dissenting judgement, Kirby used the principles of human rights from the international legal system to interpret the Constitution of Australia, something he contends will be vindicated in the near future. “Ian Brownlie, a professor of international law at Oxford University, put it very well,” Kirby said. “He said we should think of ourselves now as generally exercising municipal jurisdiction but we are also, in the courts, entrusted to exercise a form of international jurisdiction. That is, a natural development of understanding our law in the context of international law. The High Court bench is more unified today than it was when Kirby was sitting, and while this may be a positive thing for law students, Kirby was very clear in his warning that this unity may not be as positive for the development of the law. “I say (it’s) bad because you ought not be in the High Court if it’s all so clear and it’s all wrapped up and it’s all uncontroversial,” he said. Kirby also spoke of his desire to include an ‘equality principle’ in the Australian Constitution, something he, as the first openly gay justice of the High Court, feels passionately about. The wide-ranging conversation also covered his ongoing membership in the High Commissioner for Human Rights’ Judicial Reference Group and his time as chair of the UN Human Rights Council’s commission of inquiry on North Korea. 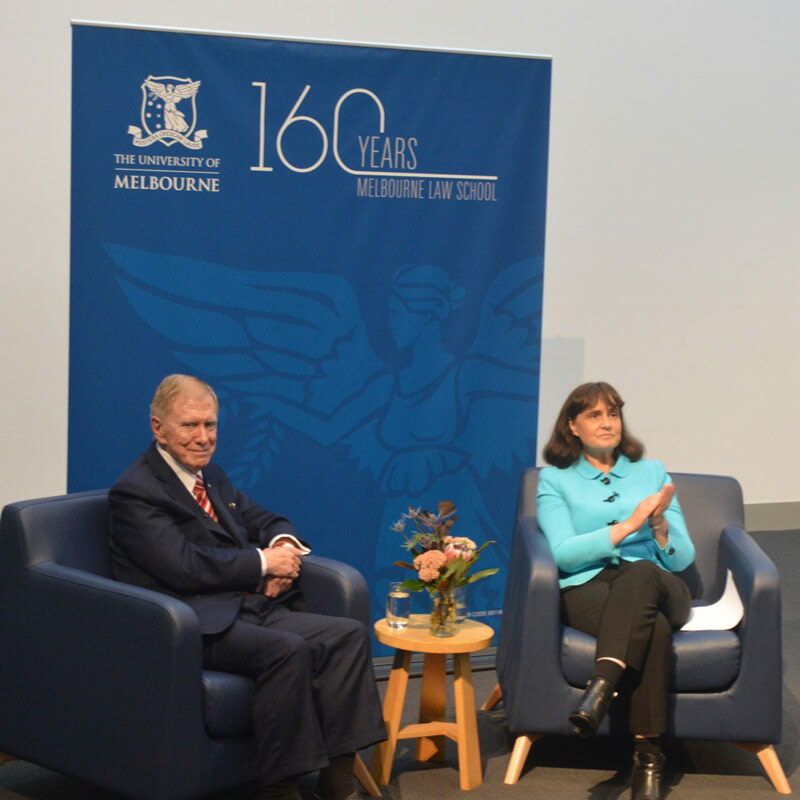 His final thoughts were perhaps his most poignant, as he implored the audience to think about the work that still needs to be done in Australian society and how the law, and indeed Melbourne Law School, will play a vital role in shaping it. “I think there’s a lot for us to do in Australia (in terms of equality and equal rights). We need more tools to do it with, and we need less compliancy, less self-satisfaction and a more questioning attitude,” he said. Find out more about upcoming MLS Events.